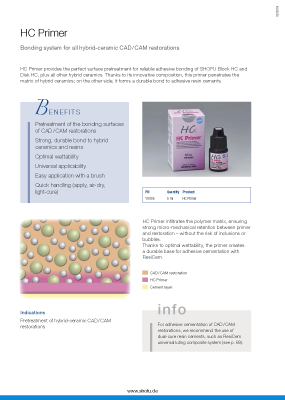 HC Primer provides the perfect surface pretreatment for reliable adhesive bonding of SHOFU Block HC and Disk HC, plus all other hybrid ceramics. Thanks to its innovative composition, this primer penetrates the matrix of hybrid ceramics; on the other side, it forms a durable bond to adhesive resin cements. HC Primer infiltrates the polymer matrix, ensuring strong micro-mechanical retention between primer and restoration – without the risk of inclusions or bubbles. Thanks to optimal wettability, the primer creates a durable base for adhesive cementation with ResiCem. For adhesive cementation of CAD/CAM restorations, we recommend the use of dual-cure resin cements, such as ResiCem universal luting composite system.